We live in a digital age where people prefer to communicate by text and email. Everything you post online leaves a footprint running right to you. So how can you send a message while leaving no trace you were ever there? Of course, you could write an old-fashioned anonymous letter. But every hastily written note is a treasure trove of evidence. Experts can read into every loop and swirl of your handwriting, fingerprints reveal your DNA, and a postmark will betray your whereabouts. Here are 10 crimes where the writer was desperate to communicate, and what they sent contained so much more than just a few lines on a page. It was Sunday night in the quiet town of Nairn, Scotland. Alistair and Veronica Wilson were putting their children to bed when the doorbell rang. Veronica went to answer it while Alistair read their boys a story. On the doorstep was a man in a baseball cap asking for Alistair Wilson. Veronica went back to the children and sent Alistair to the door. Shortly, he returned, puzzled. The man had handed him an empty blue envelope with the name “Paul” written on it. The couple was unsure what to do. But Alistair was intrigued and went back to see if the man was still there. Moments later, Veronica heard loud bangs. She went downstairs and found Alistair. He had been shot three times. The man was gone, and the mysterious blue envelope had disappeared. Alistair later died in the hospital. A rare 1920s handgun was found dumped in a drain, but no DNA was found. Police were mystified as to who would want to kill the 30-year-old bank worker. 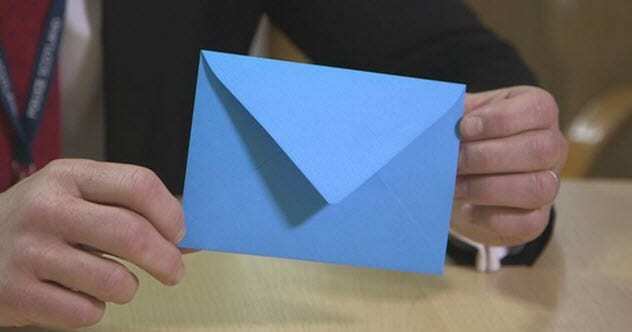 What did the empty blue envelope mean, and who was Paul? There have been no answers, and the case remains open. Julie’s letter was central to the trial but also controversial. There are strict rules allowing criminal defendants the right to challenge any accusers. The defense argued that Julie had deliberately framed Mark from beyond the grave. The court created an exception and classed the letter as “a dying declaration.” Jurors later described the letter as “a clear road map” when making their decision. Jensen was sentenced to life in February 2008. After some legal wrangling to free him, Jensen saw his conviction reinstated in 2017. In June 1962, three prisoners escaped from Alcatraz. Brothers John and Clarence Anglin and Frank Morris tunneled through a ventilation duct using sharpened spoons. They crawled out to a waiting raft made from raincoats and accordion bellows. Papier-mache heads covered with hair from the prison barbershop were left in their beds for wardens to find. Alcatraz is 2 kilometers (1.25 mi) from San Francisco Bay, and many doubt that the prisoners could have survived the crossing. My name is John Anglin. [ . . . ] I’m 83 years old and in bad shape. I have cancer. Yes we all made it that night but barely! If you announce on TV that I will be promised to first go to jail for no more than a year and get medical attention, I will write back to let you know exactly where I am. This is no joke. The FBI tested the letter for DNA, fingerprints, and handwriting analysis, but results were inconclusive. The Anglins’ mother said she regularly received cards from her sons. Family members even claim that they attended her funeral—disguised as women. The case remains under federal investigation. Joe Joe, an African grey parrot, was the much-loved pet of Cara Cosson from Bedford, England. For 17 years, he entertained his owner by dancing to Motown and squawking, “Yum! I want some,” as she cooked meals. Joe Joe has never been found despite a cash reward and a social media campaign. Robert Durst is heir to a $650 million real estate empire. His wife, Kathie, went missing in 1982. After police reopened the case, Durst fled to Texas while disguised as a mute woman. In 2003, he killed and dismembered neighbor Morris Black but was found not guilty after claiming self-defense. In 2015, HBO made a documentary The Jinx about Durst’s criminal connections. Susan’s stepson was interviewed and showed letters from Durst to Susan with the same spelling mistake and handwriting. Durst was arrested for Susan’s murder in March 2015, hours before the final episode of the The Jinx was broadcast. Nijole Siskeviciene, 44, was found strangled and dumped by a garage in October 1998. She had only been in London for six days after arriving from Lithuania to look for work. Police believed the letters to be genuine. Nevertheless, the case grew cold. In 2010, James Kennedy was arrested for drink-driving. Kennedy had changed his name to Citro and moved from London, where he had lived near the victim. DNA linked him to the murder scene. Police searched his home and found notepaper matching the letters sent 12 years earlier. Citro was jailed for a minimum of 20 years in December 2011. I have fallen into the hands of kidnappers. Don’t let me be killed. Arrange things so that the police don’t intervene. You must absolutely not take this thing as a joke. Try and get in contact with the kidnappers in the manner and the way they tell you. Don’t let the public know about the negotiations if you don’t want me killed. Three months later, John Paul’s ear was mailed to a Rome newspaper. Eventually, his father, John Paul II, negotiated a ransom payment of about $3 million, to which J.P. contributed $2.2 million (the tax-deductible maximum). The rest was made up of a loan, which J.P. gave to his son—at 4 percent interest. After his release, John Paul III tried to phone his grandfather to thank him. J.P. Getty refused the call. On December 23, 1974, best friends Rachel Trlica, 17, and Renee Wilson, 14, planned a Christmas shopping trip to a mall in Fort Worth, Texas. Neighbor’s daughter Julie Moseley, 9, begged the girls to let her tag along. The trio promised their families that they would be home by 4:00 PM. They never returned. Witnesses reported seeing them at the mall, and Rachel’s Oldsmobile was found in the parking lot, a gift-wrapped parcel on the back seat. Police were alerted, and the families turned out in force to search. The letter was signed Rachel, but the “l” had been looped over to cover an “e.” The envelope was addressed to “Thomas A. Trlica,” not “Tommy,” and was postmarked that day. FBI handwriting analysis was deemed inconclusive. No further evidence was found. The families continue to search for three girls who never came home. Rachel’s housemates returned home and found her room empty. Her tutor raised the alarm when Rachel failed to show for an exam. Police contacted Tanner, and he described the mystery man who gave Rachel a lift home. He agreed to make a TV appeal, and a witness placed Tanner at the station alone. Rachel’s hidden body was discovered, and Tanner was arrested. He admitted killing Rachel. But he denied murder, saying that he had “snapped” when she ended the relationship. He was sentenced to life in December 1991. However, he was released in 2003 after serving a bit more than 11 years. Unsure what to do, Julie asked for help on Facebook, and local paper The Oregonian ran a story on it. In 2013, The New York Times tracked down the author. Sun Yi would rise at 4:00 AM and work until 11:00 PM to rub black paint into the plastic headstones destined for Kmart. Over the years, he had written 20 letters in secret and hid them in the packaging. Sun Yi was released in 2010. He managed to access banned Western news websites and found a story about Julie and his letter. After The New York Times article, filmmaker Leon Lee contacted Sun Yi to record his story in secret. Lee helped Sun Yi escape to Jakarta, where Julie visited him. Their emotional meeting is captured in Lee’s 2018 film Letter from Masanjia. Labor camps were officially abolished in 2013, although Amnesty International disputes this. In October 2017, Sun Yi died of kidney failure at age 51. I am a budding writer and contributor to Listverse. True crime is my guilty pleasure as well as random facts and the Royal Family. I am a constant source of trivial information. Love to read, love to write, love words.